MARIO RITTER: And I’m Mario Ritter with EXPLORATIONS in VOA Special English. Today, we learn about a famous stolen art case and visit the Guggenheim Museum in New York City. We also learn about a technology that uses human energy to power devices like cell phones and computers. In March of nineteen ninety, two men wearing police officer’s clothing entered the Isabella Stewart Gardner Museum in Boston. The men used handcuffs and tape to restrain security guards. 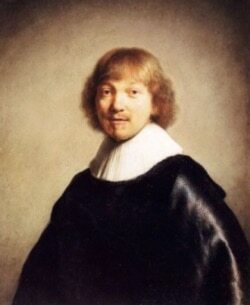 The thieves stole thirteen artworks, including three by Rembrandt. The stolen pieces also included works from Johannes Vermeer, Edouard Manet and Edgar Degas. FAITH LAPIDUS: For the first time, an American museum is holding an exhibit about the career of Korean artist Lee Ufan. 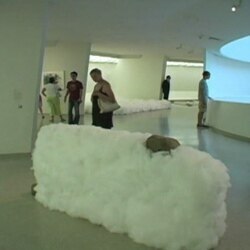 The exhibit opened at the Solomon R. Guggenheim Museum in New York City earlier this summer. The show is called “Marking Infinity.” It brings together seventy of the artist’s paintings, sculptures and drawings. MARIO RITTER: Alexandra Munroe is the Guggenheim’s expert on Asian Art. She says that ideas of change have influenced the work of Lee Ufan. MARIO RITTER: Mr. Lee grew up during the Korean War. The political changes he witnessed during the nineteen sixties also influenced his work. He became the leader of an artistic movement in Japan called Mono-ha, or the “School of Things.” He wanted to create a new kind of art that celebrated natural objects. This was art that paid attention to time and space and how an observer experiences the artworks. FAITH LAPIDUS: Lee Ufan likes to work in series. A series of sculptures or paintings will explore a similar idea. For example, several paintings at the exhibit are called “From Point.” In one work, the artist put blue paint on a brush. He touched the brush to the surface of the painting repeatedly in a straight line. Slowly, the paint disappears from the brush and the mark becomes lighter and lighter. The brushwork suggests movement and the passing of time. The work is a painting, but it also is like a performance because it shows the actions made by the artist. FAITH LAPIDUS: The team has also developed a system to permit use of the stored energy by common mobile devices. It does not require connections with wires, and can be used to create a wireless signal. 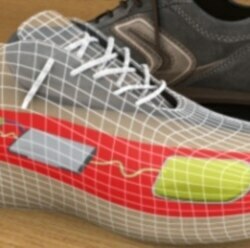 A cell phone that uses the wireless “hotspot” from the shoe would use much less power than if connected to a wireless telephone network. MARIO RITTER: This program was written and produced by Dana Demange with reporting by Faiza Elmasry, Behnam Nateghi and Rosanne Skirble. I’m Mario Ritter. FAITH LAPIDUS: And I’m Faith Lapidus. You can find our programs online with transcripts, MP3s, podcasts and pictures at voaspecialenglish.com Join us again next week for EXPLORATIONS in VOA Special English.